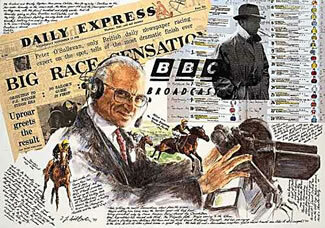 There can be few people in the world who have not at some time in their lives heard the “Voice of Racing” calling home the horses in The Derby or Grand National. It was a voice that not only communicated the thrills and excitement of racing, but which also told the listener that here was a man who cared passionately for the Sport. Behind the scenes however, few outside of racing’s hierarchy knew of Sir Peter’s charitable work in general and for animal welfare in particular. His retirement allowed him to devote more time to this important work, always making himself available to the various charities involved, and tirelessly working to better the lot of the retired, injured, or ill-treated animal, forgotten by an uncaring or unconcerned former owner. With his retirement came the opportunity for the public to show their affection for Sir Peter and with it an idea for an annual fund-raising event. The event would not only allow Sir Peter to put back into racing some of the pleasure the sport had given him over the years, but also to raise funds for the animal and racing welfare charities that so desperately need year on year support. The event - The Sir Peter O’Sullevan Annual Award Lunch, an event which will continue despite Sir Peter’s sad passing in July 2015.